Sunderland moved off the bottom of the Premier League table with a record sixth consecutive win over north-east rivals and fellow strugglers Newcastle, who had Fabricio Coloccini sent off. Adam Johnson's penalty before half-time gave the hosts an undeserved lead, after Coloccini was penalised for a push on Steven Fletcher and dismissed. The furious visitors saw Aleksandar Mitrovic denied by Costel Pantilimon. But Billy Jones' close-range finish and Fletcher's volley sealed the win. 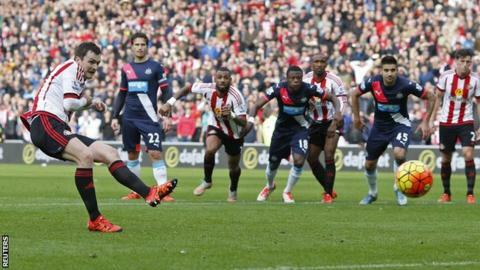 Sunderland's controversial first-half penalty changed the match after the Magpies had dominated the opening 45 minutes. The victory sees Sam Allardyce's men move ahead of Newcastle on goal difference and up two places to third from bottom in the table. Newcastle were furious with referee Robert Madley's decision because the penalty and resulting dismissal of their skipper changed the shape of what was a crucial Wear-Tyne derby. The Black Cats had been second best throughout the first half, with just three shots compared to Newcastle's 12, but were handed a route into the game when Coloccini was adjudged to have fouled Fletcher. The defender ran across Fletcher as he attempted to latch on to a through-ball but appeared to ease him out of the way with his shoulder with the ball running to goalkeeper Rob Elliot. Madley though believed there was an infringement and, having awarded the penalty, was left with little choice but to send him off for preventing a goalscoring opportunity. The Football Association's law on impeding an opponent says: " A player who places himself between an opponent and the ball for tactical reasons has not committed an offence as long as the ball is kept within playing distance and the player does not hold off the opponent with his arms or body. "If the ball is within playing distance, the player may be fairly charged by an opponent." Can Allardyce keep Sunderland up? Allardyce has never been relegated from the Premier League as a manager, keeping the likes of Blackburn, Bolton and West Ham in the top flight. Rarely can he have taken such a tough job on though, with the Black Cats bottom of the table going into Sunday's match on the back of a 12-game winless run. He has never lost his opening Premier League home game in charge of a club though and became the fourth consecutive Sunderland boss to beat Newcastle in his second game in charge. Allardyce will know his side have a battle to stay up but the manner of Fletcher's final goal, volleying home a sweeping move late on, and a first clean sheet of the season will be reason for hope. To rub salt into the wound for Newcastle fans, Allardyce had an unpopular spell in charge of the Magpies in the 2007-08 season. And these fans have not had much reason for optimism in recent months, with just one win now from the last 21 league matches. They must have thought the corner had been turned when, after thrashing Norwich 6-2 last time out, they controlled the first 45 minutes of the derby. But, following the dismissal of Coloccini, their afternoon took a turn for the worse as Steve McClaren's 200th Premier League game as a manager ended in an 82nd defeat. Sunderland boss Sam Allardyce told BBC Sport: "We've carried that precious piece of history on - the fourth manager to beat Newcastle in their second game as Sunderland boss. "This was quite an achievement considering the low ebb we're in at the moment - facing a rival with the extra pressure of having won the last five derbies." Newcastle manager Steve McClaren said: "We were the better side by a distance. We controlled it, created chances and never looked like giving away anything at the back. Even with 10 men in the second half we still controlled it. Referee decisions are out of your control. "It was never a penalty. The penalty and red card was a double whammy. In the first half the team were excellent. I was totally relaxed. We were in control. I said to players that's what we must continue. If we continue doing that and get decisions right then we'll do OK."
The 13 shots Newcastle had in the first half was the the most they have had in the first half of a Premier League game since September 2014 v Hull. Adam Johnson is now Sunderland's joint-top scorer in Premier League derbies against Newcastle, with four. Newcastle have had 10 red cards since the start of 2014-15, three more than any other side. Newcastle have managed to score just one goal in their last 627 minutes of football against Sunderland. Billy Jones netted only his second PL goal, after also scoring against Newcastle in April 2013. Sunderland will look to build on their first win of the season away to Everton next weekend, while Newcastle entertain Stoke in the Premier League. Match ends, Sunderland 3, Newcastle United 0. Second Half ends, Sunderland 3, Newcastle United 0. Hand ball by Ayoze Pérez (Newcastle United). Hand ball by Jamaal Lascelles (Newcastle United). Foul by Vurnon Anita (Newcastle United). Adam Johnson (Sunderland) wins a free kick on the right wing. Goal! Sunderland 3, Newcastle United 0. Steven Fletcher (Sunderland) left footed shot from the centre of the box to the bottom left corner. Assisted by Younes Kaboul following a fast break. Sebastián Coates (Sunderland) wins a free kick in the defensive half. Corner, Newcastle United. Conceded by Younes Kaboul. Substitution, Sunderland. Sebastian Larsson replaces Jeremain Lens. Attempt missed. Florian Thauvin (Newcastle United) left footed shot from outside the box is close, but misses to the right. Assisted by Moussa Sissoko. Attempt blocked. Florian Thauvin (Newcastle United) left footed shot from outside the box is blocked. Assisted by Moussa Sissoko. Corner, Newcastle United. Conceded by Sebastián Coates. Substitution, Newcastle United. Florian Thauvin replaces Paul Dummett. Attempt missed. Aleksandar Mitrovic (Newcastle United) header from the centre of the box misses to the right. Assisted by Daryl Janmaat with a cross. Steven Fletcher (Sunderland) wins a free kick on the right wing. Attempt blocked. Paul Dummett (Newcastle United) left footed shot from outside the box is blocked. Assisted by Vurnon Anita. Attempt missed. Vurnon Anita (Newcastle United) right footed shot from the centre of the box is too high following a corner. Adam Johnson (Sunderland) hits the bar with a left footed shot from outside the box. Assisted by Jeremain Lens. Attempt missed. Ayoze Pérez (Newcastle United) left footed shot from the left side of the box is high and wide to the left following a corner. Corner, Newcastle United. Conceded by Costel Pantilimon. Attempt saved. Georginio Wijnaldum (Newcastle United) right footed shot from the right side of the box is saved in the bottom left corner. Assisted by Moussa Sissoko. Goal! Sunderland 2, Newcastle United 0. Billy Jones (Sunderland) right footed shot from very close range to the centre of the goal. Assisted by Yann M'Vila following a corner. Attempt blocked. Yann M'Vila (Sunderland) right footed shot from the left side of the box is blocked. Assisted by Adam Johnson with a cross. Corner, Sunderland. Conceded by Chancel Mbemba. Attempt blocked. Steven Fletcher (Sunderland) left footed shot from outside the box is blocked. Assisted by Jeremain Lens. Hand ball by Daryl Janmaat (Newcastle United). Offside, Newcastle United. Robert Elliot tries a through ball, but Aleksandar Mitrovic is caught offside. Foul by Lee Cattermole (Sunderland). Attempt saved. Ayoze Pérez (Newcastle United) right footed shot from outside the box is saved in the centre of the goal. Attempt saved. Aleksandar Mitrovic (Newcastle United) right footed shot from the centre of the box is saved in the bottom left corner. Attempt blocked. Jermain Defoe (Sunderland) right footed shot from the right side of the box is blocked. Assisted by Adam Johnson. Foul by DeAndre Yedlin (Sunderland).